Be incorporated immediately with years of filing history. 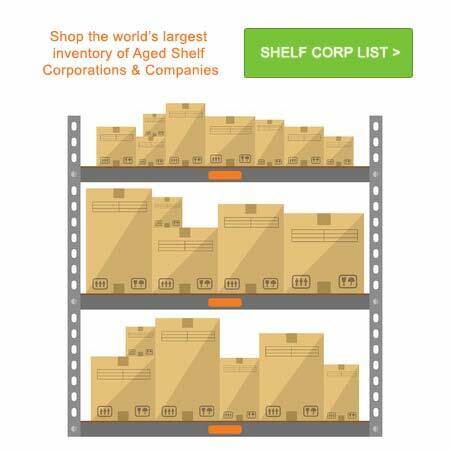 Browse the world’s largest inventory of of “pre-filed” aged shelf corporations and companies for sale. All business entities are in good standing through maintenance, reinstatement or the equivalent. The business name can be changed for a small fee. As we have stated throughout this section, when operating a “shelf” or “aged” corporation or LLC we recommend honesty, integrity and full disclosure as to the date that you acquired the entity. Such an entity may not increase the owner’s ability to bid on government contracts. It may not give the owners easier access to credit as there are many factors that a lender considers before extending credit. Factors include, but may not be limited to, the income of the company, the profitability of the company, the creditworthiness of the company and possibly that of the principals. Lenders also often consider the assets that secure the loan. So, the age of the company is not the only factor and it should not be considered a major factor in business creditworthiness. If the age of an aged shelf corporation gives the owners easier ability to obtain venture capital, it would likely be a minor factor, if at all. Factors that have significantly greater weight tend to be the experience of the key personnel and a sound business plan along with the ability of the executives to effectively communicate and provide support for the viability of the plan. An experienced professional who is in the business of taking companies public has informed us that he prefers to utilize aged shelf corporations rather than new entities. However, this is a matter of opinion only and may or may not be advantageous in every situation for every person. So we suggest seeking legal counsel on this and other issues discussed herein. There are strict Securities and Exchange Commission and State Securities regulations and filing requirements concerning public companies and they are not considered do–it-yourself projects. It is prudent to have experienced attorneys guiding the go public process. An aged company alone may not give the owners access to investment opportunities, or as discussed above, it may not provide fewer limitations when applying for corporate credit. The aged shelf corporations and LLCs herein includes articles of incorporation or articles of organization and a corporate kit. The corporate kit comes standard with a place to store the records of the corporation, blank minutes for meetings, a standard set of sample corporate bylaws, blank and unissued stock certificates or membership certificates. It may or may not have an existing federal tax ID number. We emphasize that the companies are in their shell form we are not selling stock or other securities. They should only be used for legal purposes. Banks and most other lenders will require evidence that a company has actually done business and is profitable and creditworthy before issuing credit, not merely that the company has been in existence for a certain number of years. As stated above, taking a corporation from private status, to publicly traded status requires more than just that the corporation was incorporated for a certain period of time. In involves filings and other requirements that must be approved by departments of the government and regulatory bodies. A corporation with no business history may not, in and of itself, be able to obtain government contracts more easily merely because it has been in existence for a certain period of time. Nothing herein is to be considered an offer to sell securities in the state of Nevada or any other state or country. There is no sale or offer whatsoever of any note, stock, bond, debenture, evidence of indebtedness, certificate of interest or participation in a profit-sharing agreement, a limited partnership interest, an interest in a limited-liability company, collateral-trust certificate, preorganization certificate or subscription, transferable share, investment contract, vatical settlement investment, voting-trust certificate, certificate of deposit for a security, fractional undivided interest in an oil, gas or other mineral lease or in payments out of production of such a lease, right or royalty, a put, call, straddle or option on a security, certificate of deposit or group or index of securities including any interest therein or based on the value of any of the foregoing, or, in general, any interest or instrument commonly known as a security or any certificate of interest or participation in, temporary or interim certificate for, receipt for, whole or partial guarantee of or warrant or right to subscribe to or purchase any of the foregoing as described in NRS 90.295.